What would happen if your neighbor had a mishap on your property? What if you were found at fault in a major traffic accident? Do you operate a home-based business and have your clients come to your house? Umbrella liability insurance is so named because it acts like an umbrella sitting on top of your auto and homeowners liability policies to provide extra protection. (Even if you don’t own a home, you still need renter’s insurance to cover both your liability and your personal property) Umbrella insurance is designed to give you added liability protection above and beyond the limits on homeowners, auto, and watercraft personal insurance policies. With an umbrella policy, depending on the insurance company, one can add an additional 1-5 million in liability protection. This protection is designed to “kick-in” when the liability on other current policies has been exhausted. Umbrella liability is relatively affordable and can be easily coordinated with your existing insurance policies. It is by no means just for the wealthy. It is a good idea to try and get your umbrella liability, homeowners and auto policies from the same insurance company resulting in a substantial premium discount. This is called bundleling. You can also eliminate the problem of dealing with different insurance companies if a claim is ever made. 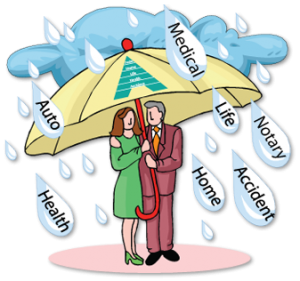 We can offer you either an insurance company have can bundle your home, car and umbrella liability or if you are happy with your current homeowners and auto company and you only need to add on umbrella liability we can do that for you also. The choice is yours.